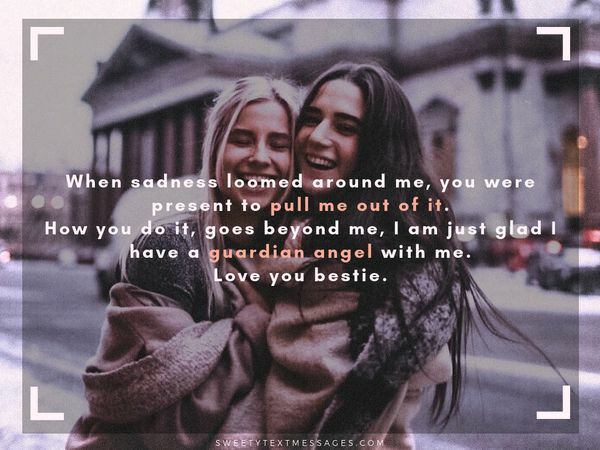 A. Bronson Alcott once said: “Friendship is the soul’s heaven.” These are some of the most beautiful words unfolding the miracle of having a friend and being somebody’s friend. 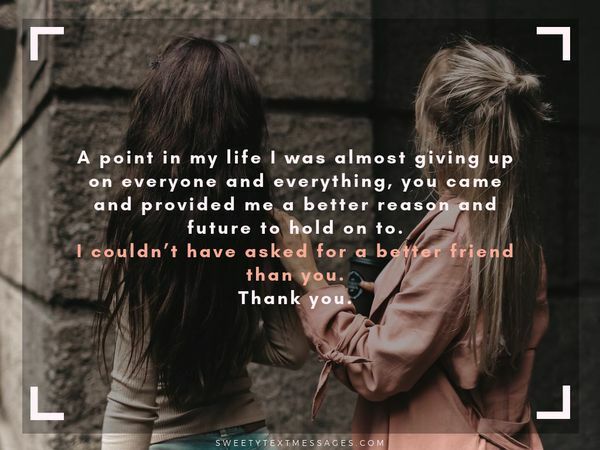 Sometimes we take our friendships for granted, don’t we? We think that this is how the things are supposed to be. But it always takes two to tango. At times it’s essential to give and take and say kind words so that your friend knows that you are there for him/her. So, if you have a person you can call your best friend, it’s time to write words of gratitude. 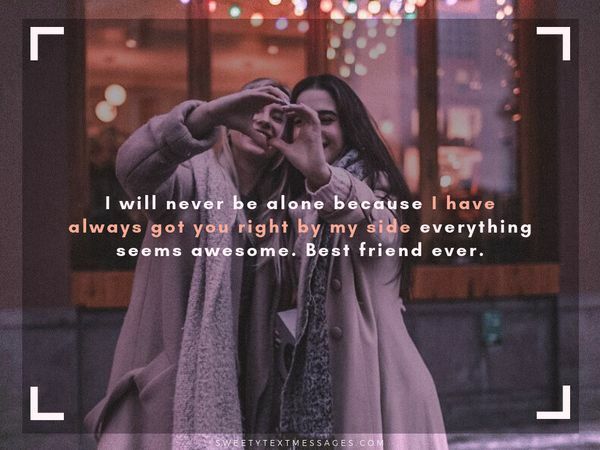 We’ve listed great long paragraphs to send to your best friend as we as BFF paragraphs with emojis which you can share on Facebook or Twitter in one click. 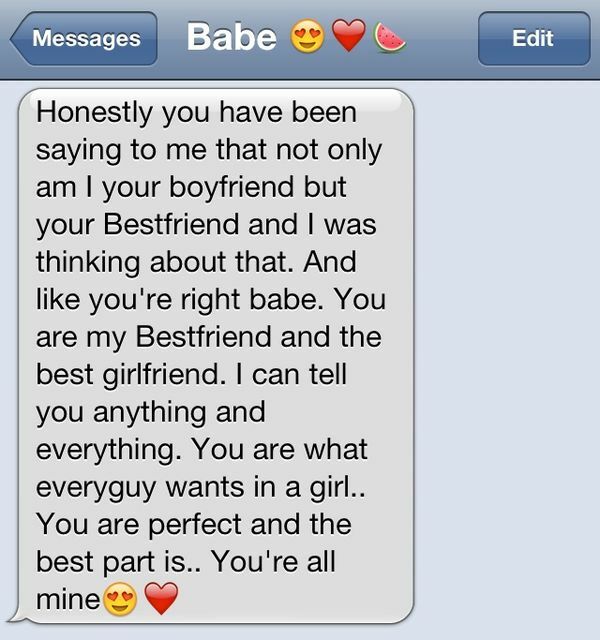 Moreover, we’ve got a great variety of nice best friend paragraphs for a boy and cute best friend paragraphs for a girl. Is it your best friend’s birthday coming soon? 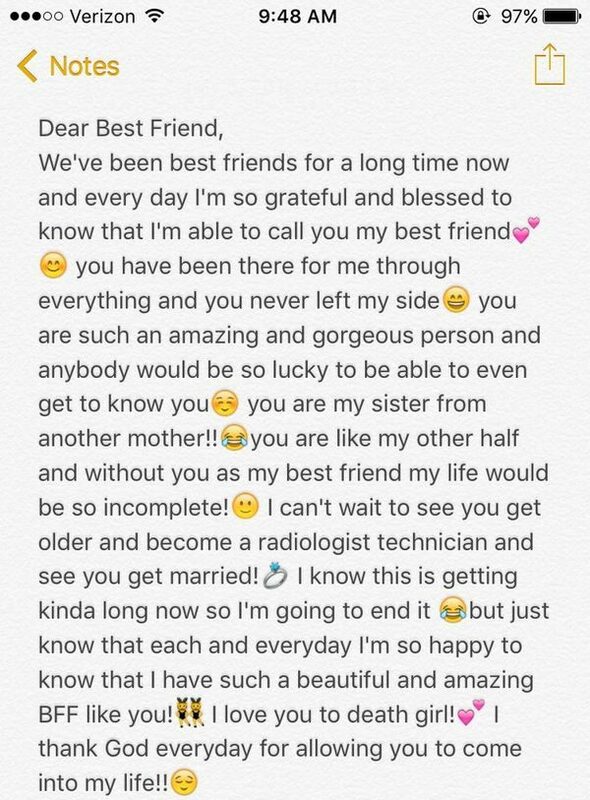 Be the first to congratulate him/her on this special day by sending one of the cute paragraphs for your best friend to wake up to. One of the most powerful instruments which people can use is a word. Do you agree? 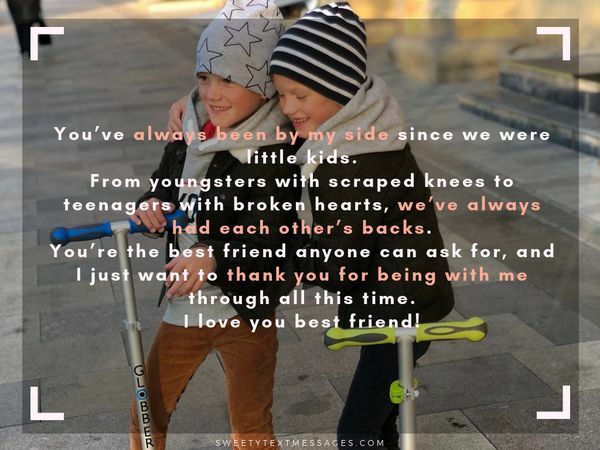 If yes, use our collection our collection of inspirational paragraphs about the best friend to celebrate the gift of friendship. If we had to walk one thousand steps to be together again, I would walk nine hundred and ninety-nine steps so you could only take a step. If we had to drive ten miles across the city just to see each other, I would drive nine miles so you could drive for just a mile. I feel honoured to be with an awesome friend like you and I will always cherish our friendship. I love you so much more than you could ever imagine. You’ve been there for the heartbreaks, the disappointments, even the failures. You know about the boy who broke my heart, and we both know you’ll hit him with your car if you ever get the chance. You were there when I didn’t get into that dream school, when I flunked that exam. You cheered me up and brought me ice cream. 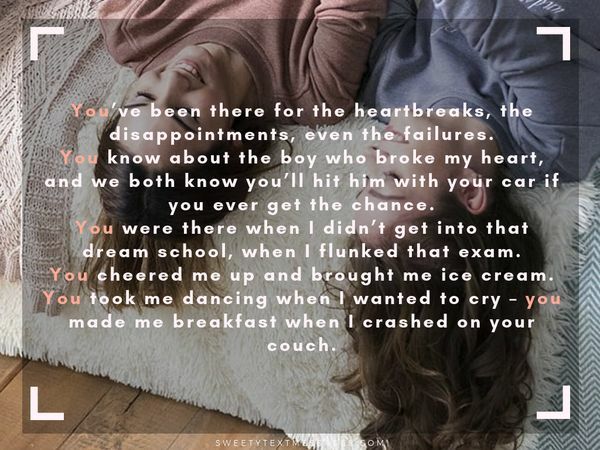 You took me dancing when I wanted to cry – you made me breakfast when I crashed on your couch. Thank you for being you. You are incredible my dear, and I can’t wait to constantly remind your husband that he got crazy lucky and out kicked his coverage big time. You are beautiful inside and out. On the outside, you are so gorgeous; you’re very own unique and incredible definition of beauty, and I know I’m one of many who see it. You’re intimidating to stand next to in pictures because I know your light shines so bright, but I’ll gladly stand next to you and take a picture, because I’m so excited to show the world how breathtakingly beautiful my best friend is. On the inside you are even prettier, with a warm heart, a sharp mind and an unbelievable personality. You are hands down the funniest person I know, and I still can’t believe that someone as funny and hilarious as you chooses to spend her time with someone as dweeby and awkward as me. I mean, half the time we’re laughing at some fail I had or something stupid I did, so I guess I contribute a little bit to our constant laughing. You are so kind and so sweet, and have the biggest heart of anyone I know. God spent a little extra time when he made you, because you’re the total package: you’re beautiful, awesome and amazing, all wrapped in one, and I’m so lucky he put you in my life—he knows I’d be lost without you. I am the luckiest man in the entire universe because I was given an opportunity not just to meet but also have someone as special, beautiful and amazing as you are as my best friend. I promise to always cherish, respect, honour and love you so much with every breath in me till the end of time because a friend like you is very rare. You know that I love you right? Well, I do. Even though we don’t see each other every day, I will never stop cherishing our friendship. Even if we don’t hear from each other every time, I will never stop reminiscing about you and the beautiful moment we’ve had together. 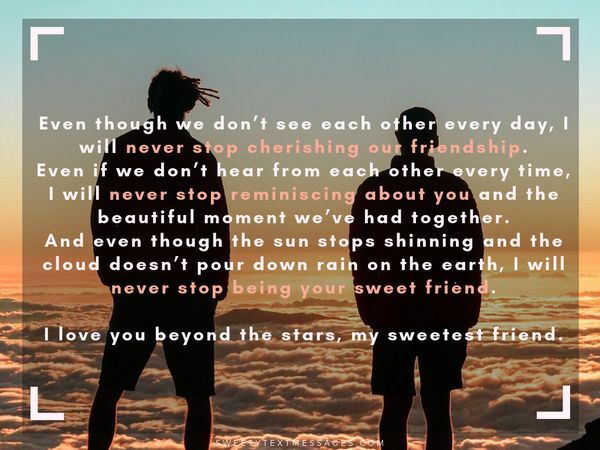 And even though the sun stops shinning and the cloud doesn’t pour down rain on the earth, I will never stop being your sweet friend. I love you beyond the stars, my sweetest friend. I might not be able to know everything about you, my dearest. Because each and every day is another avenue for me to know you a bit more than before; to get to be closer to you and cherish you so much more than ever before. And I want you to know that one of the reasons why I’m with you is to know you much better. I adore you, my beautiful friend. There will come a time in our life when we need to demonstrate the value of true friendship, many of us have failed in these duties, we neglect them and give ears to unnecessary things, it’s shameful to say I have failed you, and you have been the true definition of a good friend, even in my bad times, you stood by me, I am really grateful and happy to have you as my best friend. I love you bestie. Certain things happen in a certain way at a certain time and place for a certain reason. And sometimes, God brings certain people into our lives for a purpose, but whatever reasons He had in mind for making our path cross and bringing us together, I don’t really care, because I’m honored and grateful that He did. I love you always, my dearest friend. When sadness loomed around me, you were present to pull me out of it, how you do it, goes beyond me, I am just glad I have a guardian angel with me. Love you bestie. Having you in my life is really wonderful, you are not just a friend, you are like family now, and I am sorry if I haven’t really been there for you when I should. Friendship isn’t always about partying, grooving and wasting some precious time. But also to give advice and listen to thoughts and opinions, all these you have done and still do. Truly you have been a great friend to me. I love you unconditionally. In my difficult times, you show your skills, when I am tired you give me a shoulder to rest on when I am in a problem you don’t rest till I am out of it, you are wonderful, and you have always shown me I could count on you at any time. 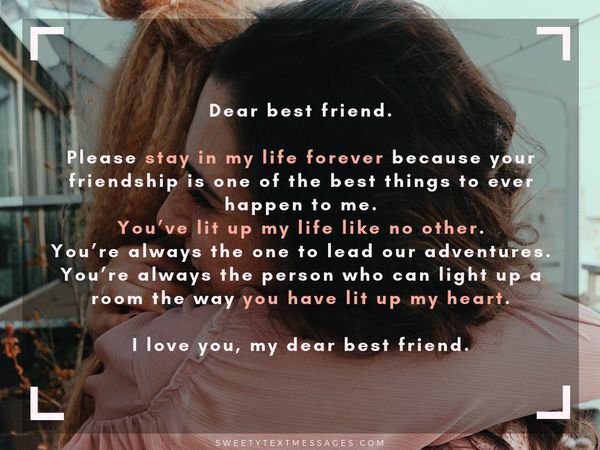 Dear best friend. Please stay in my life forever because your friendship is one of the best things to ever happen to me. You’ve lit up my life like no other. You’re always the one to lead our adventures. You’re always the person who can light up a room the way you have lit up my heart. I love you, my dear best friend. 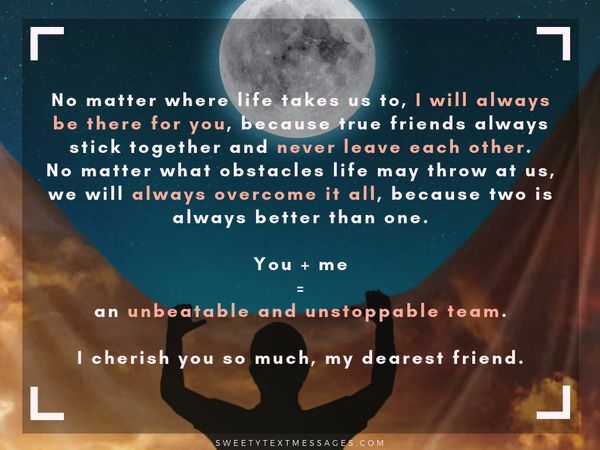 A true friend always understands even when the other one is not saying or doing anything, and you have always understood me even in the moment when I am not saying anything as the best and true friend which you are. Thank goodness that our path crossed and I met an understanding friend like you. I cherish every moment with you, my lovely friend and I love you so much. You happened to be someone who I don’t expect I will get along so well and be happy with. You were a familiar stranger as you were someone whom I don’t know before. But guess what? You turned out to be the best thing and one of the most beautiful things that ever happened to me in life. I love you, my darling friend. A point in my life I was almost giving up on everyone and everything, you came and provided me a better reason and future to hold on to. I couldn’t have asked for a better friend than you. Thank you. The thought of you cross my mind this morning and I was filled with gratitude within me for having a special friend like you in my life. Just as true friendship is not measured by how far we’ve been together but rather how well it has been between us. So also real bonding is not measured by the time we’ve spent together in each other company but rather the solace and solitude that comes with being with you, my awesome friend. I love you more than you know. 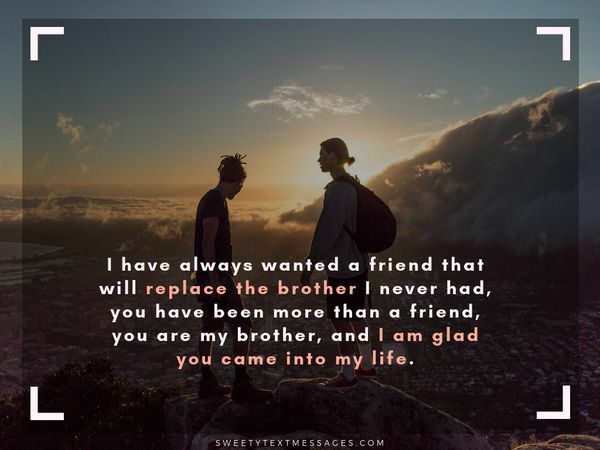 I have always wanted a friend that will replace the brother I never had, you have been more than a friend, you are my brother, and I am glad you came into my life. I’m grateful to God for making our way crossed and brought you to me. We might not be together every day, but I am sure that you will always be there for me whenever I need you. Because your friendship is like the sunrise which I can’t always have throughout my day, but I’m certain that you will always be there each time I wake up to the break of a new dawn. I love you more than love itself, my best friend. No matter where life takes us, I will always be your best friend. I will be there when you need someone to talk to, whether you’re elated or depressed. I’ll be there when you want company through a long, lonely day. I will be by your side through thick and thin, in sickness and in health because you’re my best friend and I cherish you so much. They say you don’t get to pick who you’re related to. That’s true. But you do get to pick who your family is. Your real family. And you’ll always be my family. We’re closer than sisters could be, thicker than any thieves. You know all my secrets, all my wild ambitions. You support every one of my craziest fantasies. What would I do without you? I guess I’d have to watch Rent and Titanic on my own, on the couch, with a pint of ice cream and no one to cry with. I’d have to learn to take care of myself. I’d have to dole out my own advice. I’d have to scheme and dream – all on my own. If our friendship was to be a big beautiful building; I would be the ground, to protect you from every creepy thing and I would be the roof, to be a shade over you during the rainy day; I would be the wall to shield you from the scourging dart of failures; I would be the door, to close every disappointment behind you and I would be the window, so that you can always see clearly every opportunity within your reach. I love you to the moon and back, sweetheart. Thank you first of all for accepting me and loving me for exactly who I am. This isn’t easy. I can be stubborn, difficult and confusing, but you love and accept me for me. There are days I wonder when you’ll finally come to your senses and move on and find a new BFF, one who isn’t so complicated, but to my amazement, you never do. You tell me you’ll take the good with the bad, and when I question whether I have any good left, you’re always there to reassure me and show me that I do. Thank you for loving me in my dorky and difficult moments, moments where if the rest of the world saw them, they’d probably walk away. Thank you for understanding me like no one else does; if we didn’t have the connection we did, I can’t imagine how lonely and big this world would feel. Because of you, this world seems like a little friendlier place, one I can see myself being a part of. I will never be alone because I have always got you right by my side everything seems awesome. Best friend ever. You are more than a friend that’s why I call you sister, I can’t think of a better way to express who you are to me, you love me with all your heart, you advise me, cry with me, share my pains, you help me forget my sorrows, you always have a way to keep me going, you are my sister, that sister that will never give up on me. I love you so much. Who would I text when I can’t sleep? Who would I FaceTime until 2AM, just because we can? Who would talk me through every family crisis, every wardrobe malfunction, every anxiety attack? I tell you all the secrets I can’t tell my mom. You know everything – everything about me, probably better than I know myself. You know I tend to overreact, but you don’t judge me for it. You never have. You’ve been there for the smallest victories and the biggest catastrophes.